I am interested in painting as a surface; the actual texture, paint as matter. Color as thick and opaque or as transparent ,delicate wash. Color as unnameable emotive energy. Brushstrokes as they activate planes of space, each one with its own unique intensity of motion. The vertical or horizontal line as it is freed to move beyond the frame. 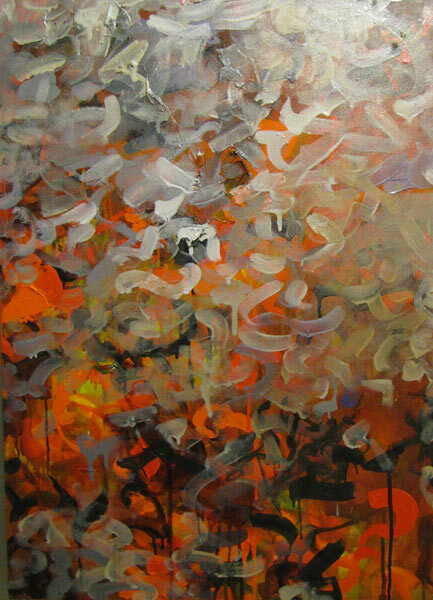 The painting as a vibrational whole which can pull into depth or radiate outward to affect the space in a room. I am interested in how paintings interact with each other when adjacent or from a distance. My paintings are directly related to my life experiences . It is a mysterious relationship between life and art; a symbiotic, living link. It occurs during the creation of a work or in the stillness when nothing is happening. It occurs in the space between the painting and the viewer; the painting in the viewer . It is how a painting tells me about my life; about how I feel, how I don't feel, how I have changed, how I could change.